The Monday Hiking Group chose a perfect day with sunshine and 70 degree weather. We parked at the PCT Upper Trail Head and hiked from there. The goal was to get everyone right up to the ridge above Upper Lake. The group set a good pace and it took about 2 hours to get to Upper Lake where we grabbed a bite and then proceeded up to the ridge. 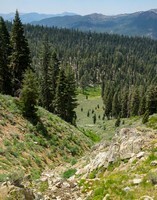 Sabin Phelps did an exploratory trip, after talking with local hikers, to find a loop around to the PCT from the ridge. It ended badly with him sliding down a hill on his bottom. The good news is he was fine and rejoined us later. The bad news is one should really have a more ample bottom for such adventures. Sunny received extra credit for climbing to the rim twice, once to attain her hiking objective, and the other when she learned that chocolate was being doled out on the ridge after descending to the Upper Lake for lunch. "Give me your chocolate and no one will get hurt!" she cried. We were all cowed by that declaration and she was rewarded. Dan Dawson then took the lead from Upper Lake, forming a peleton worthy of the Tour de France. Off they marched down the mountain at a blistering pace. I watched in absolute wonder as I did a casual amble down the hill as sweep. The peleton crossed the finish line long before me and were ready to ramble on. 4 1/2 hours to do around 9 miles, with lunch and some gawking from the ridge, was good time indeed. I checked the luggage for steroids but came up empty. Most of us celebrated with refreshments at the Roadhouse in Yreka. The end of a perfect day with great views and lots of comradery.